Our Moroccan road trip had been more exciting and full of surprises than we could have anticipated. 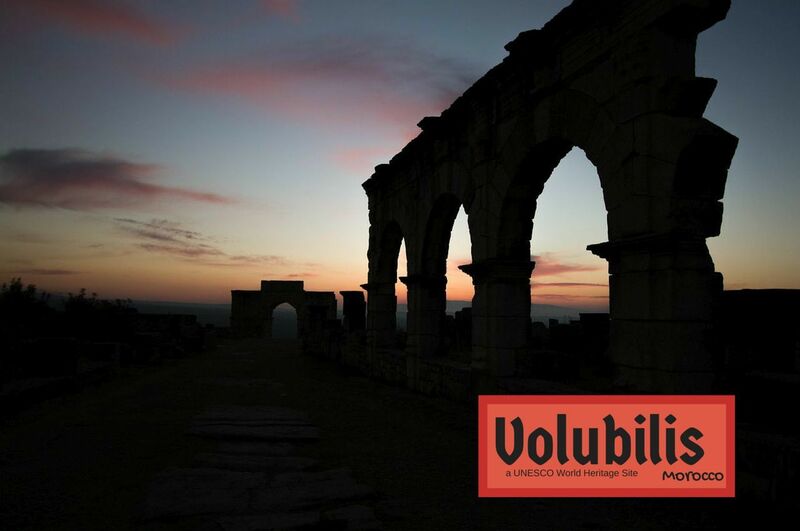 We’d been awed by the sheer beauty of the Morocco in places like Volubulis, El Jadida, Chefchaouen, and Essaouira. 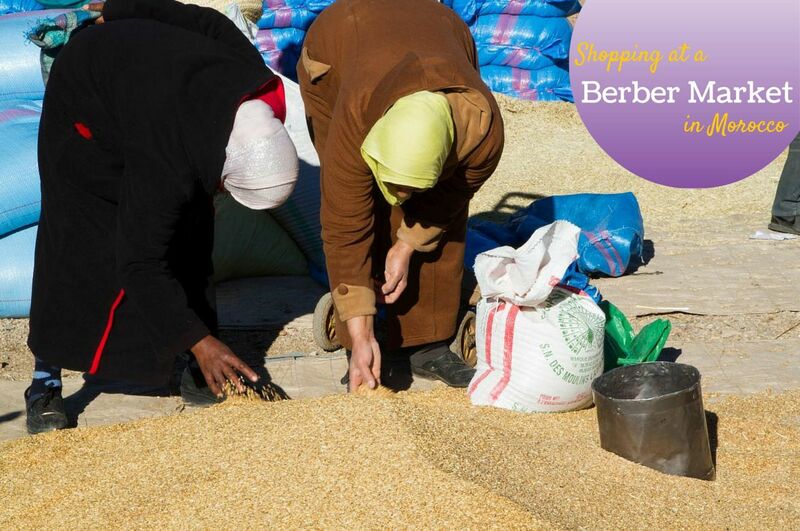 We’d been overwhelmed at the chaotic energy of the Marrakesh food stalls, the Berber market in Azrou, and the Fez souk, but our next stop had us all sitting on the edge of our seats…for real! As we drove, or should I say careened, through the winding roads of the High Atlas mountains we enjoyed the snow-capped mountains, the sheep trucks, the almost green valleys, and the friendliness of all the people we passed. 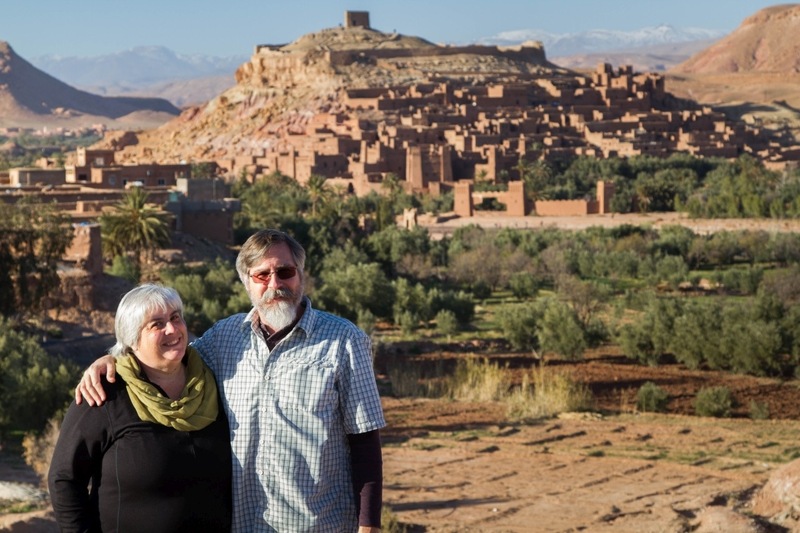 We were headed to Ait Benhaddou, another world heritage site to check off the list. 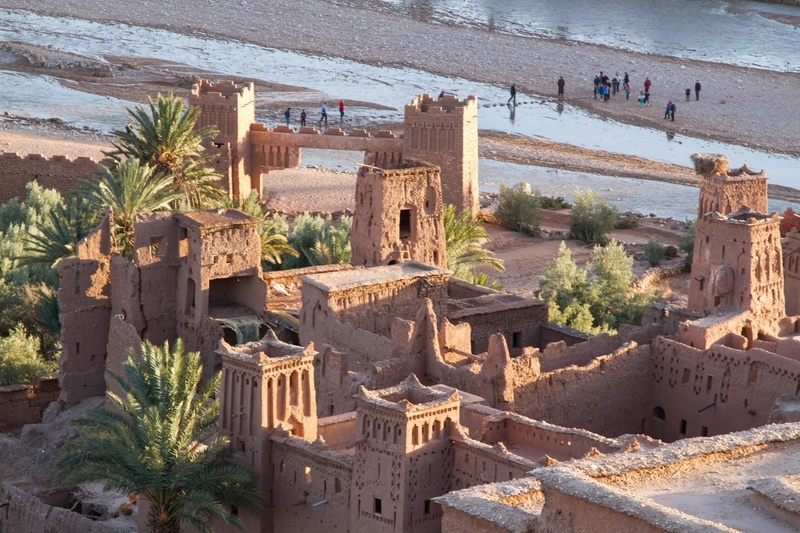 The Ksar of Ait Benhaddou located in the majestic High Atlas Mountains of Morocco is a must-do on any North African itinerary. This was our goal, Ait Benhaddou, or nowadays thanks to Game of Thrones, it might be better known as Yunkai. Actually, the city has been featured in many other full-feature films as well. How could anyone, let alone a movie producer, not want to go here? It’s one of those places that doesn’t seem real, a place of make-believe and dreams. Can real people still live here? As it turns out there’s not many who still live in the old part of the city, but they certainly do go there to sell souvenirs and run small cafes. Getting here was definitely part of the fun. 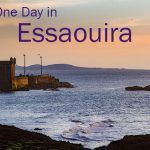 We had about a six hour drive from Essouira so we got on the road early, stopping to see some amazing sights along the way, such as those world-famous tree-climbing goats, and arriving in late afternoon. Perfect. 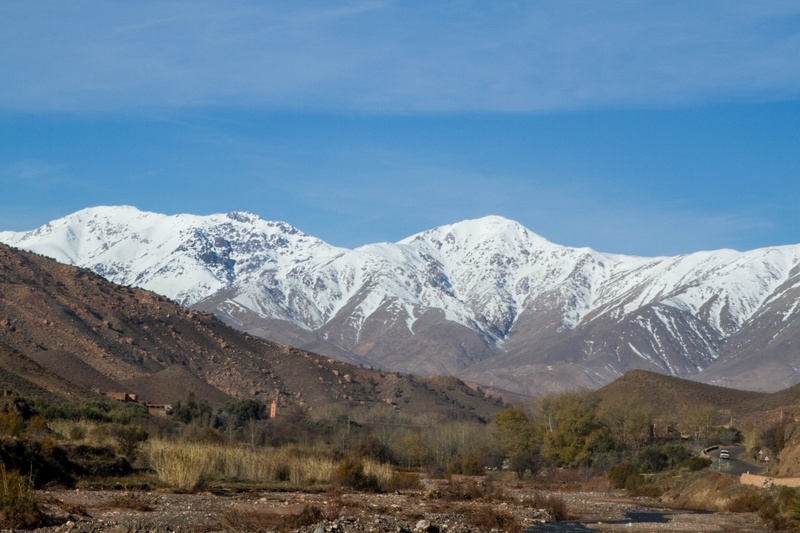 Driving through the snow-capped mountains of the High Atlas affords stunning views the entire way. We like to get our hotel set up as soon as we arrive, so we headed straight to Kasbah Isfoula and verified that we would love to have dinner there as well. The hotel was a comfortable boutique style complete with towels curled up into swans on the foot of our bed, so we knew that we would be well taken care of while we were there. Decorated in rich Moroccan furnishings, the dining room was full of warm orange and reds, with kilims and hand woven textiles. Our dinner of chickpea soup, traditional chicken pastilla, paired with a vibrant Moroccan Merlot was amazing, but we had all that to look forward to after heading out to the ksarof Ait Benhaddou, the old city. Power Tip: Arriving in a destination in late afternoon always works for us, because we don’t have to wait to check into our hotel and we are arriving during some of the best light for taking photographs – the golden hour. Tourists and locals alike must cross the Ounila River by stepping on stones and sandbags. We drove down the road, easily following the signs, and parked the car. There are no vehicles in the ksar, because there is no bridge that crosses the Ounila River. This is probably one of the main reasons that Ait Benhaddou has been able to keep its old-world charm intact. First, we had to cross the river which had rocks with sand bags covering them, making a path that you had to step from the one to the next to cross. The river, although not deep, was rushing by with a bit of a current, so to make some money the local children walk in the water holding your hand to help you across for a small tip. No matter how you feel about children begging or working in these capacities, they had smiles on their faces, and this small act also lent more credence to that colonial feeling where the tourist, all dressed up in safari gear. is waited on hand and foot. I’m not condoning it, but I have to say I don’t think it’s going to change any time soon, and as the tourist who was being helped, you look like a complete heartless git if you let them help you and not tip. It was definitely one of those many times when no matter what your feelings or your ethics, you kind of just have to go with the flow and accept it. Save these pins for planning your Moroccan Itinerary. Crenelations and decorations adorn the ksar of Ait Benhaddou with its world heritage pre-Saharan architecture. The High Atlas are physically intimidating, hard to cross mountains that brood over the desert like a slumbering giant. 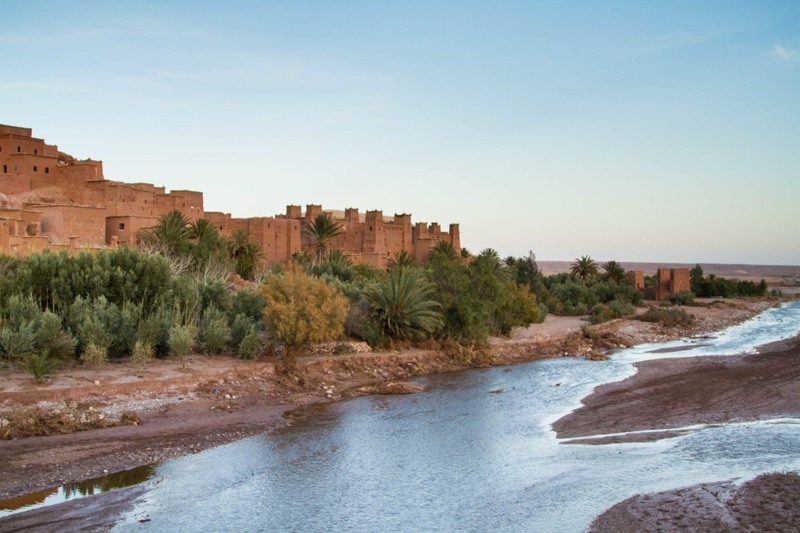 Add to that the imposing fortress, the ksar of Ait Benhaddou, it’s many towers bristling like sharp teeth, and you can’t help but feel awed in this magical setting. After we walked through the gate with lots of hawkers, we immediately started to climb…and climb, and climb. The uneven walkways and staircases are all narrow, and the buildings being made of clay, straw, and wood have a rough-textured exterior. There were some handrails, but of course they weren’t everywhere. Since we were there in winter, it wasn’t hot at all, in fact it was a bit windy and chilly so the climb was exhilarating, but I would imagine how difficult it would be if the temperature was much warmer. One of the iconic souvenir shops you encounter as you climb the ksar of Ait Benhaddou. 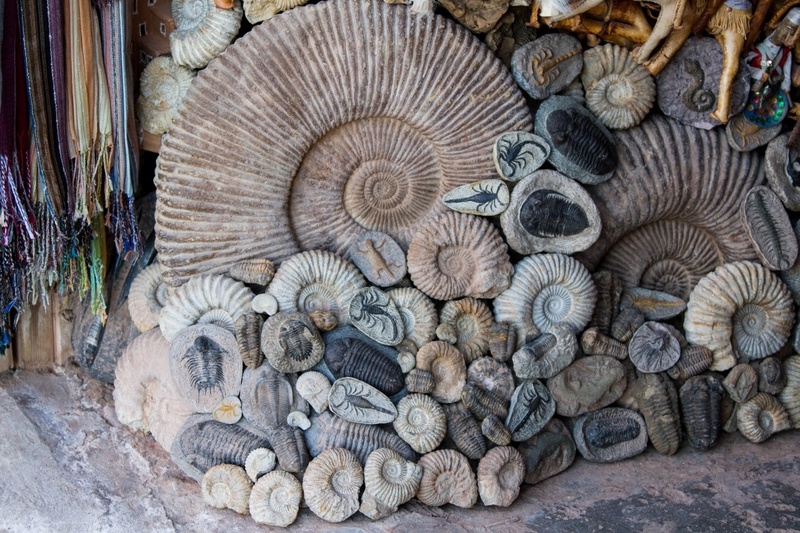 Fossils from the High Atlast Ounika Valley are one of types of souvenirs you can buy in the ksar. As we climbed, we marveled at the ancient pre-Saharan architecture, where for over 500 years people have been living and trading in the ksar. Ait Benhaddou was one of the mid-points of the trading caravans that trekked from the Sudan to Marrakesh. The ksar, or group of dwellings, is surrounded by high walls with towers on the corners which were built to defend the residents. The houses within are everything from small and modest to luxurious and grand; some of them are open to visitors for a very small fee and well worth the visit. A decorated door and archway in the Ksar Ait Benhaddou. 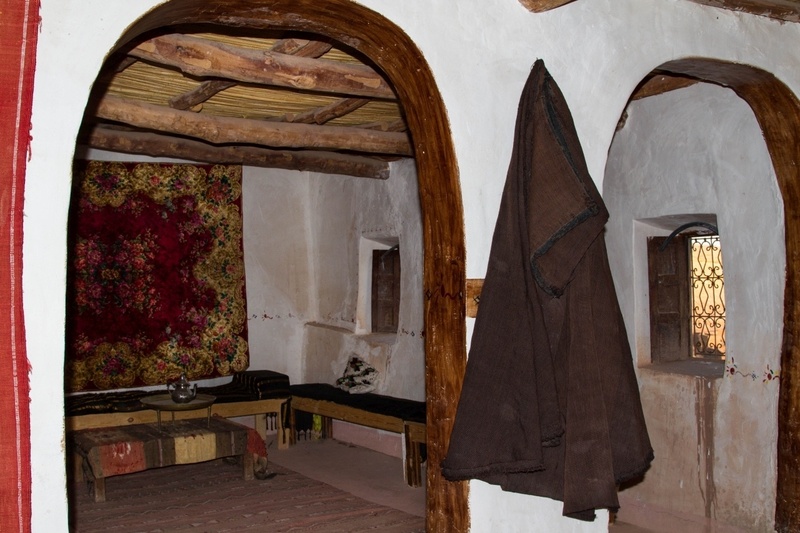 The interior of a traditional pre-Saharan home that you can pay a small fee to tour as you climb to the top of Ait Benhaddou. As we wound our way up the hill to the top of the crenelated walls and towers, we were rewarded with amazing views of the fortified city and the Ounila Valley. There were plenty of opportunities to stop and buy souvenirs as well, everything from local handicrafts, postcards, to rugs. 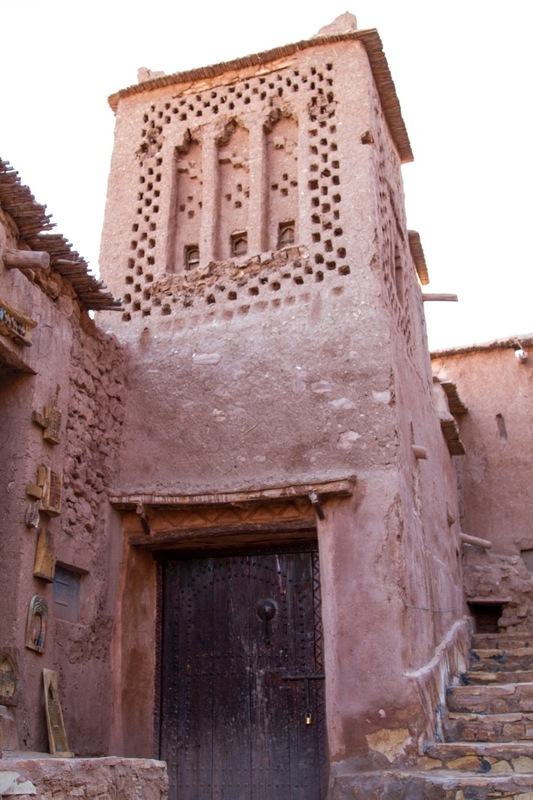 The ksar still lives up to its trading heritage. From a higher vantage point, it’s easy to see the many crenelated towers, and the clay, wood, and hay adobe that has been prominent for the last 500 years in the Ounika Valley. 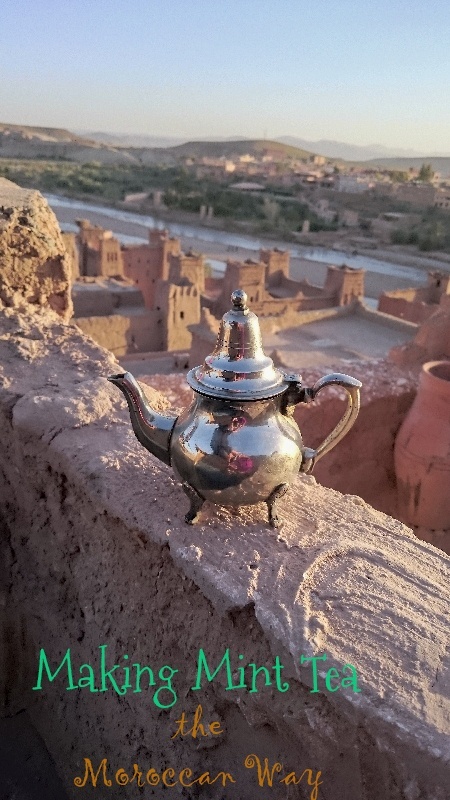 At the top of the ksar, an inviting glass of tea awaits. We made it to the top a little before the sun started to set, where we were beckoned through this mysterious door to an open-air cafe so we could warm up and enjoy the views with a great glass of Moroccan tea. Being so high up, the winds were starting to scream through the valley and warm tea was just the remedy we were looking for before we had had enough and headed down to the car. The Ounika River with the Ksar Ait Benhaddou as the sun is setting in the High Atlas. Ait Benhaddou is definitely one of the most beautiful places I have been. Not only is it completey different with its amazing history and architecture, but it feels so magical and mysterious, from a time long past. If you haven’t gone, I would highly suggest you make a plan to get here before it is forever changed. Ait Benhaddou is located in the Ouarzazate province in southern Morocco, and you have to make it through the High Atlas mountains to get there from pretty much anywhere else in the country. We came from Essouira, however most people make a dash from Marrakesh. 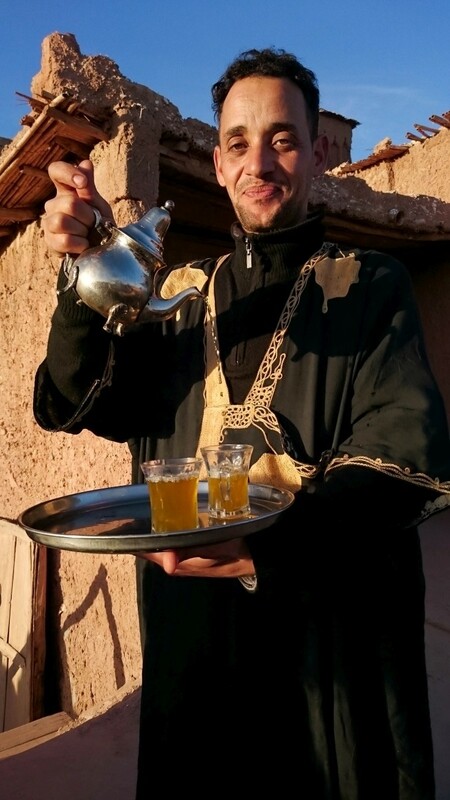 Getting to Ait Benhaddou from Marrakesh: Travel in Morocco can be slow and difficult, and one of the most popular ways to get here, and probably the easiest and least time-consuming is by taking one of the many Marrakesh desert tours that are offered. A trip to Ouarzazate is usually combined with a camel trek or desert overnight or some Atlas Mountain hiking and of course the tour companies take care of getting you there. We passed only two vans full of tourists, so it’s not a bad way to go. 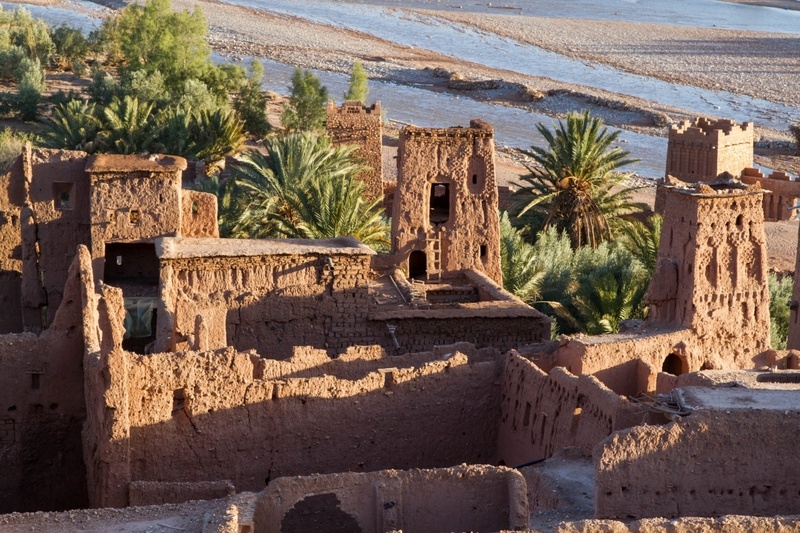 You can also take a bus from Marrakesh to Ouarzazate, which is a little past Ait Benhaddou, but you can take another bus from there or hire a taxi or driver. It depends on how much flexibility you want. Check schedules and prices at the CTM website. Of course, we drove. It was part of our two weeks in Morocco road trip, and if you love to be in charge of where you go and when you stop it was really not all that bad. The biggest issue was making sure to be off the road at night. It’s dark; people wear dark clothes, and anything could be in front of you. It was just safer that way. As I mentioned above, we stayed at the Kasbah Isfoula which I can highly recommend. There are not many places to eat other then very small cafes, so it certainly is convenient to find a place that has meals offered as well. 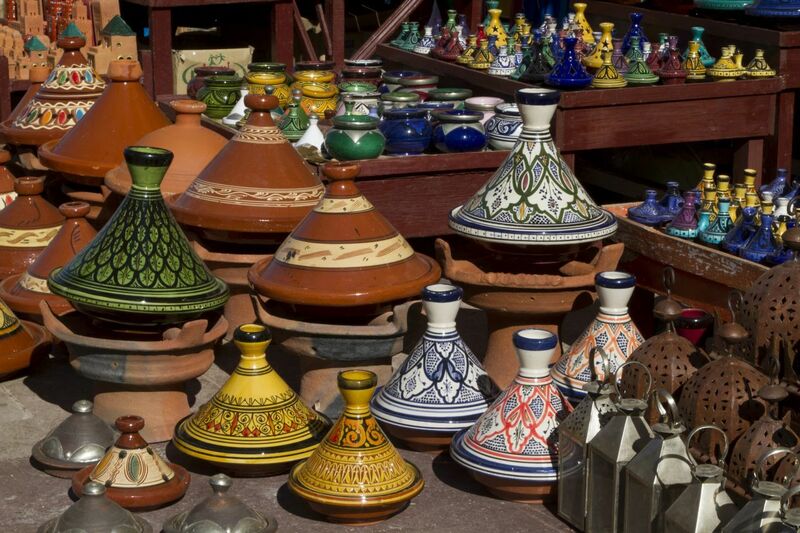 Are you planning a trip to Morocco? Don’t you want to visit one of the best places in the country? 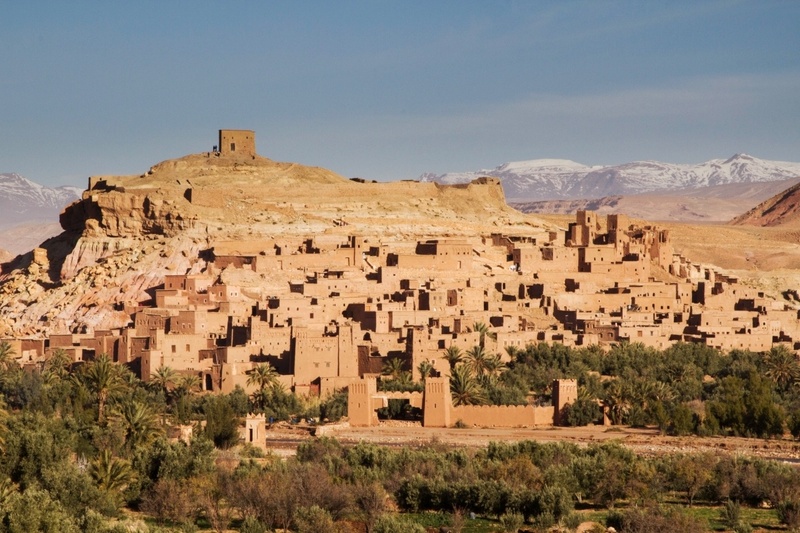 Add the ksar of Ait Benhaddou to your itinerary and experience the majesty, mystery, and beauty of the High Atlas Mountains. Save this pin for some travel inspiration or Moroccan trip planning! Marrakesh, a Magical Intro to Morocco! Brilliant post and photos Corrine. Have been to Morocco, but never made it to the high Atlas mountains. Hope to get there someday. Madhu, It’s so beautiful. I hope you do get there. Wow, this place looks incredible. I love Old Cities like that. Michelle, It’s one of the most “different” places I’ve had the pleasure of visiting. I highly recommend it. Oh my! Your pics look straight out of a movie! Ahhh, I wanna go everywhere but the world is so damn big! How long have you been trekking though Africa? I wanna try that tea in the pics! Rocio, I love Africa and go whenever I can. It’s an amazing place! 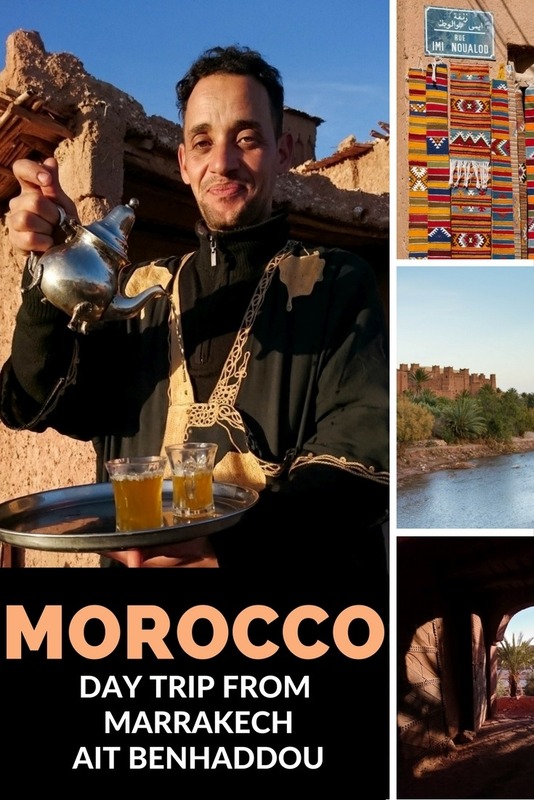 Morocco has never been on our bucket list (mainly because they’re not really LGBT friendly…), but now that we’ve read your post and seen your beautiful pictures, we’re about to change our mind! Hi, I do think Morocco is a great destination, but I hear you. It’s hard to support a place that doesn’t support you. Let me know if you go, so I can pay attention to your thoughts and experiences there! Kay, I hear you. This often happens to me. I go someplace, have a great time, go home. Then I read an article of this great place to go…yes, I plan on returning. At least now I know I’m not alone. 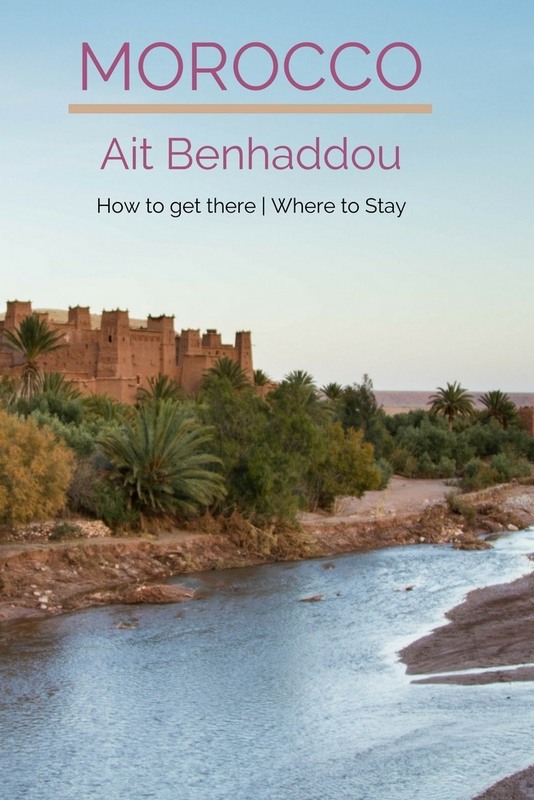 I hope you do make it to Ait Benhaddou. It’s pretty darn cool. Wonderful photos! I’d go here in a shot but sadly my husband is less keen! Emily, Oh, that’s too bad. 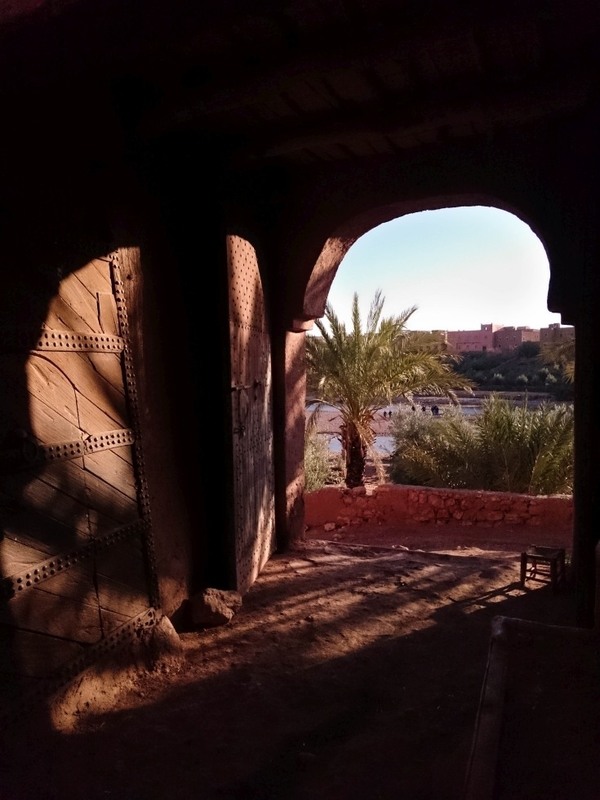 Morocco is an amazing destination, and Ait Benhaddou one of my favorites! I loved Ait Benhaddou. I bought a rug there but it wasn’t exactly what I expected (remember – never take your eyes off the rug once you strike a deal). Rhonda, Oh how true! Not many people have been there, such a great place! Oh wow, I haven’t made to Morocco yet, but loved this post so much. Your photos of the souvenir shop is just stunning and I would love to see myself as one of those tourists crossing the river, stepping across on those sandbags. Lyn, It’s quite a bit off the beaten path but very doable. It’s such a great destination. I hope you make it there. Luke and Meagan, Thanks! It really is a throw back to the way past. It’s such a surreal location. I think you would love it. Danik, I’m sure you would love it. It’s enough off the beaten path to still be very special! I hope you get there. Holly, Petra is a beautiful place as well, but completely different. In Petra there really aren’t any man-made dwellings, the people live in the caves. 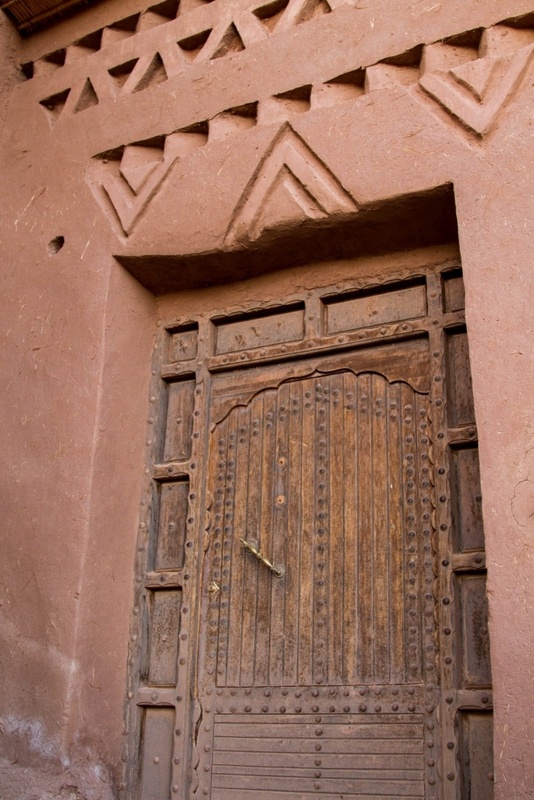 In Ait Benhaddou they built the houses from clay, hay, and wood. Both are fascinating destinations! Holly, Yes, so true. It’s wonderful to sit, relax, sip tea, and maybe even talk with some locals. I agree! Ryan, Thank you. It is a great spot. It’s hard to say what is happening when you are only there a very short time. Wow! Just wow! Your first photo of the Ksar of Ait Benhaddou had me wanting to visit, even before I went on to read the post. 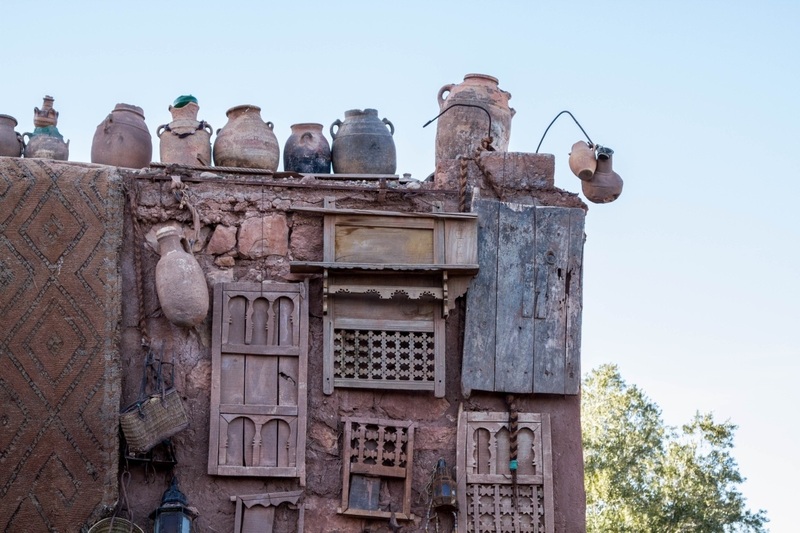 I had no idea that the Atlas Mountains of Morocco contained such treasure, and had always assumed they were more about the mountain landscape… plus as a GoT fan, of course I’m keen to visit Yunkai!! Your recommendation of Kasbah Isfoula appeals too, it looks gorgeous. This is going straight onto my To Do list! Kavita, And I’m sure you will make it there. I’m sure you will love it. It is cool, very cool. They’ve actually shot many, many films there…why not? Right?! The vision of the castle, with the river below is surreal. It was fascinating to see the beautifully shaped fossils, what a great souvenir they make! Everything about Ait Benhaddou is so exotic and magical. 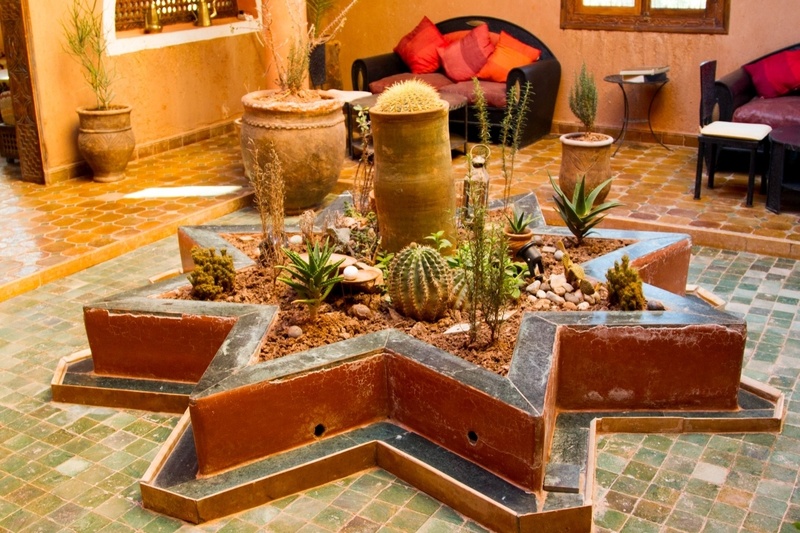 Certainly a destination to add to the Morocco itinerary. Punita, It is! I loved every minute of it, but sipping the tea at the top was my favorite. Marteen, It was pretty tame, actually but fun. I love the buildings and their decorations as well. Fantastic photos, and it looks like you had a great time! I have not been to Morocco yet but I know I will be going here if I do. I just love exploring ancient ruins / cities like this. Damien, It’s well worth the tromp! I hope you do! Morocco has always been a source of great fascination for me. But I was not much aware about Ait Bennhadou. We see many posts and articles about Marrakech but not about this place. I can see that it was a totally unique experience starting with the crossing of the river which itself sounds like an adventure. Sandy, Just getting to Ait Benhaddou is an adventure…the Atlas Mountains are pretty interesting, but yes, Morocco can offer you some things that most people are not aware of. I hope you go. Love this post! What a fabulous country to explore! Lisa, It was a great trip! Wow, these are some impressive mountains. I did not know that parts of Game of Thrones were filmed in Morocco. Learn something new every day. 😉 Loved seeing the snow topped mountains. Melody, The Atlas are impressive; such great sights and sounds. We loved the whole trip. Have you been to Morocco?